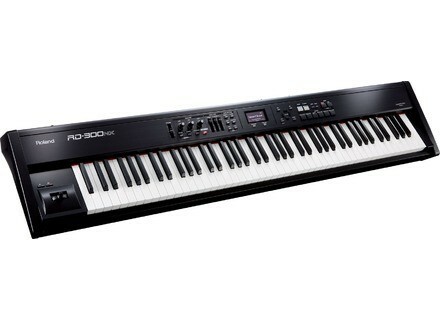 RD-300NX, Digital Piano from Roland in the RD series. Roland announces that the RD-300NX Digital Stage Piano, described as the most affordable member of the RD-series stage piano lineup, is now available. The RD-300NX features Roland's SuperNATURAL Piano sound engine, new Ivory Feel-G keyboard with Escapement, and a Sound Focus feature, designed to ensure that every note will be heard, even subtle pianissimo passages, according to Roland. The stage piano is described as lightweight and portable, for both students and gigging musicians. Also onboard the RD-300NX are two types of electric piano sounds, giving players emulations of classic EPs. The Piano Designer feature allows users to customize both acoustic sounds. The RD-300NX is equipped with Roland’s Ivory Feel-G Keyboard with Escapement. The keys also feature Roland’s Ivory Feel, a moisture-absorbent material designed to prevent slipping from perspiration during performance. The RD-300NX sports a bright LCD display. The One Touch Piano feature found in other RD-series instruments is also included. The RD-300NX also features additional pro sounds, including organs, strings, synths, rhythm sets, and more. Audio files can be played back via USB memory on the RD-300NX. It also comes with a DP-10 Damper Pedal; the optional RPU-3 Triple Pedal is available for players that desire a grand piano pedaling experience. The RD-300NX is shipping now with a suggested retail price of $1,999.00. [Musikmesse] Korg microPIANO Shipping Korg announces that their piano is now available. [Musikmesse] Korg SP-170S Korg announces the new SP-170S digital piano. [Musikmesse] Roland FP-4F Roland introduces the FP-4F Digital Piano, the latest member of the FP piano family to feature SuperNATURAL piano technology.